Nebraska athletic director Bill Moos takes questions from the media after announcing the dismissal of Mike Riley as Nebraska’s head football coach. Photo by Kenny Larabee. Mike Riley is no longer Nebraska’s head football coach. 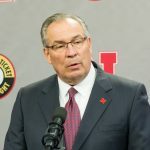 “At 9:00 this morning, I met with Mike Riley and notified him at that time that I was going to relieve him of his duties as head coach of Nebraska Football,” Nebraska athletic director Bill Moos said as he took the podium on Saturday afternoon. Riley appreciated the conversation and the way Moos went about it. Moos met with Riley’s assistant coaches at 9:30 a.m.
“I told them that all obligations obviously to them were going to be kept, and had members of my staff in the room to address questions,” Moos said. Linebackers coach Trent Bray will serve as the interim head coach until a full-time replacement is found. Bray’s father, Craig, was the defensive coordinator for head coach Dennis Erickson at Arizona State from 2007-2011. Moos’ son, Bo, played under Erickson and Craig Bray for all four seasons. As for any other assistants getting retained, Moos said it will depend their recruiting work. He mentioned “one or two” other assistant coaches from Riley’s staff could be kept on, but did not specify who. That decision will come down to the next head coach. Moos admitted he hadn’t gotten to know many of Riley’s assistants since he was hired on Oct. 15. Moos then met with about 60-70 percent of the Nebraska Football team at North Stadium. Some of the players were not in town and unable to attend. Several of the players that spoke afterward said they received a text, notifying them of a team meeting that morning at 10. The press release was received at approximately 10:13 a.m. in the form of a written statement by Moos. Shortly thereafter, a handful of players took questions from the media waiting outside of North Stadium. “He’ll be around for a little bit, so if we need anything from him, he’ll be there for us,” Brown said. Jr. QB Tanner Lee said Riley handled “an obviously tough situation” about as well as anyone could. 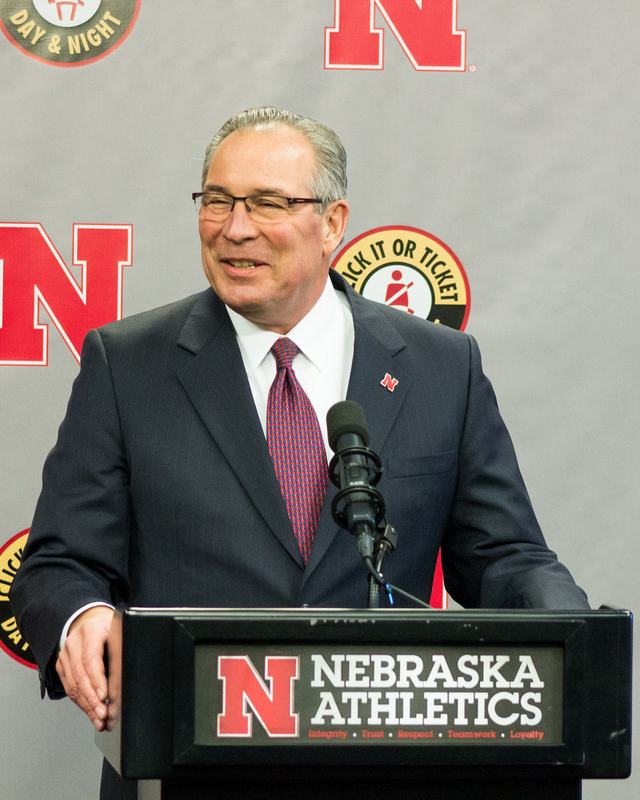 Brown said he’s encouraged by Moos’ plan for the future of Nebraska Football. “He came here to be at the top and get Nebraska back at the top, and hopefully they’re able to accomplish that,” Brown said. So. CB Lamar Jackson elaborated some on what Moos told the team. Moos began his press conference by giving a timeline of how the morning went, what he told Riley and the team, and what led to the final decision. Moos’ first day on the job was Oct. 23. Nebraska beat Purdue 25-24 on Oct. 28, but lost the final four games of the season, including a 33-point loss to Minnesota and a 42-point loss to Iowa this past Friday. “I didn’t feel good about the Minnesota game,” Moos said when asked when he knew it was time for a change. Moos said as of early Saturday, the University is in a full-fledged search for a new head coach of Nebraska Football. Moos assured that Nebraska has everything it needs from a resources stand point to compete for championships again. With everything in place, Moos believes it should take 2-3 years for a new coach to get Nebraska back to competing for championships, depending on the scheme and style of play the team runs. “If I tried to bring in Mike Leach and run the veer option here, that’d probably take five years,” Moos said. He was asked a number of times about the man atop many Husker fans’ shortlists, and if he’s a very good option. Frost has UCF ranked No. 15 in the country and unbeaten at 12-0 after topping No. 22 South Florida 49-42 on Friday night. UCF will now face No. 17 Memphis in the American Athletic Conference championship on Dec. 2 at 11 a.m. central. There was a report earlier this week that newly hired UCLA head coach, and former head coach of the Oregon Ducks, Philadelphia Eagles and San Francisco 49ers Chip Kelly, had turned down an offer from Nebraska. Moos said no offer has been made to any candidate, but thinks Kelly will do well getting back to coaching. “He had a Heisman trophy winner (Johnny Manziel in 2012),” Moos said. “I think he’s a really good coach and excellent recruiter. Beilema was let go as Arkansas’ head coach late Friday night, immediately following their 48-45 loss to resurgent Missouri on Friday night. The Razorbacks also just finished 4-8. Peterson was the head coach of Boise State from 2006-2013, where he won two Fiesta Bowls. He’s been the head coach at Washington since 2014. Riley was appointed by former athletic director Shawn Eichorst on Dec. 5, 2014 to succeed Bo Pelini, who was dismissed on Nov. 30, 2014 after going 9-3 in his seventh season. Riley, 64, finishes his three-year Nebraska at tenure at 19-19 overall and 12-14 in Big Ten play. Nebraska finished the 2017 season at 4-8 overall and 3-6 in the Big Ten. Four wins is the lowest total for a Nebraska Football team since 1961. Riley had previously spent a total of 14 years at Oregon State in two different stints, finishing his time in Corvallis with a 93-80 record. In 17 years as a head coach at the college level, Riley’s is 112-99. His best season in Lincoln came in 2016, when his team finished 9-4 overall and 6-3 in the Big Ten. The Huskers started 7-0 that season, but finished 2-4, including a 38-24 loss to Tennessee in the Music City Bowl. Riley now becomes the fourth different coach to be dismissed from Nebraska since 2003. >> Moos said Bray and no other staff members will be on the road this week recruiting, which could signal that a hire isn’t far away. >> Nebraska got outscored 42-0 in the second half of their 56-14 loss to Iowa on Friday night. Moos was asked how he handled his feelings while that was going on. >> Moos said he’s had many conversations with fans all over the state, and “never wants to see Memorial Stadium empty in the third quarter again.” This was in reference to when Nebraska trailed Ohio State 35-0 at halftime in Lincoln on Oct. 14; the night before Moos was introduced.